It has been difficult to go beyond the world of anonymity when it comes to political activism which seems to be what everything comes to in the end in Newburyport. I can’t write letters to the editor or show up with a bag over my head – it just wouldn’t work. Now I have finally decided to shed this encumbrance. Anonymous writing has been a great literary device with a rich past in American history when it comes to courage and patriotism. Others like Benjamin Franklin and Samuel Clemens just couldn’t initially prove themselves until they wrote under a pseudonym. But unfortunately in Newburyport, this cloak has recently become stained. While you practically have to get a background check to post an editorial in the Daily News, the commenters online have abused an excessive generosity by the paper. Now, others; jealous of my blog’s unique standing; have copied its format but rather use it for distortion of facts, misinformation and lies. Yes, I am coming out of the closet – and just in time – it is getting rather stinky in there. As ever, I will remain the P. Preservationist and will proudly continue to add more and more to the website as research and time permits. All of us together including other bloggers in town have become amazed as we have just scratched at the surface of our ancient city. It is my continuing hope that enough information will be gathered that it becomes contagious and we all catch a healthy vision for Newburyport’s future. My new blog name, Brick and Tree, reflects my primary interest in infrastructure. A boring subject in any other town, it’s the stuff that makes Newburyport a national leader and in which if we get it wrong, we end up with a lousy future. Things like historic architecture, conservation, downtown, history, open space, parks, schools, trails, trees, waterfront and even our sidewalks all are crucial. As for my name-calling, well; what can I say? If the shoe fits, wear it. It used to be that developers & homeowners wouldn’t dare propose demolition to completely intact, solid structures – they would reserve such demands to a building that was absolutely sorry looking on the exterior. At least, they would reason, the abutters would be so horrified at the negative affects to the streetscape that they would approve of such destruction. Now, they make no pretense. Word must be getting out that many Newburyport citizens could care less what happens to the city’s historic district. Instead of every man for himself, it’s every house for itself. We have a great structure across from the High School surrounded by historic buildings with great significance – and the owner wants to tear it down. Its only crime is that its right on the edge of the threshold for an historical home. When the 1984 posting was established, the cutoff was 1934. This house was built just at the time of being right at the minimum of 50 years. But if you check the www.newburyporthistoricdistrict.org listing, it is definitely labeled ‘contributing’ and thus is worthy of preservation. 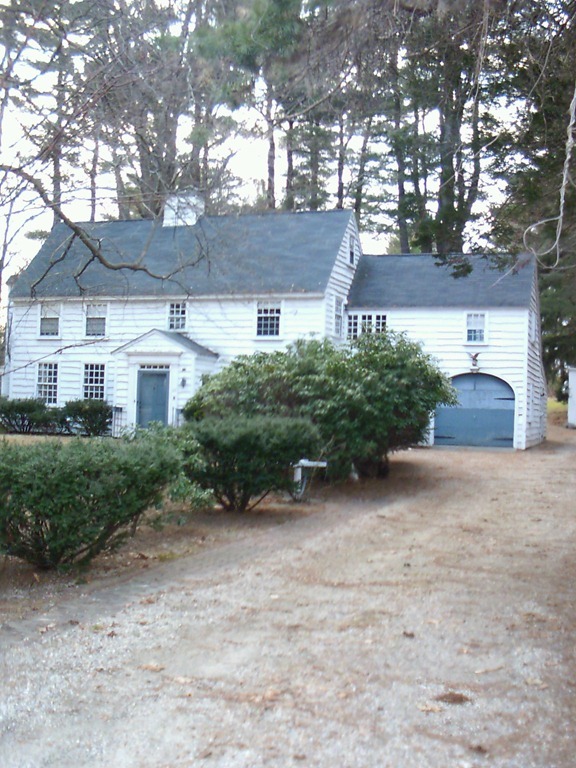 According to the sliding scale of the National Register of Historical Places; this house is well within protection now by the Newburyport Historical Commission. From a regular poster whom I trust implicitly, The Rindler House was built in the 30’s with material and features from the historic houses that existed between Summer and Winter Streets. Many of the homes were moved but tragically many more were demolished so this swath of road could construct the Route One underpass. As John Lagoulis would recount, Newburyport’s downtown was an important way station between Boston and Portsmouth and points north. That was until Route One bypassed it. According to the anti-LHD crowd, the natural desire of this owner is to preserve and at least renovate the home. But not so, the out-of-town owner just doesn’t care – time to tear it down and replace it with a ‘new’ building. It is shameful – that is why I feel the ENTIRE district needs protecting. That’s why our predecessors went through the trouble of getting the homes for all the historic district on the Register. Under the LHD, it would be protected from demolition and this whole misery wouldn’t even be brought up! PS. They’ve hired a well respected local lawyer to pave the way. Alas, unlike TV’s Perry Mason, you don’t get to choose what your client wants to do – in our society, everyone deserves legal representation even those who want to do harm to our city. People who are anti-LHD keep stating that there is no need for historic preservation protections and the City has done just fine without it. Unfortunately, this statement is made from ignorance. One of the tremendous benefits from having a local historic district is the economic ripple affect for a community. In other words, you could have a house on the other side of Route 95 near Turkey Hill Road and receive the same economic benefit from being in Newburyport as if you lived just off State Street. 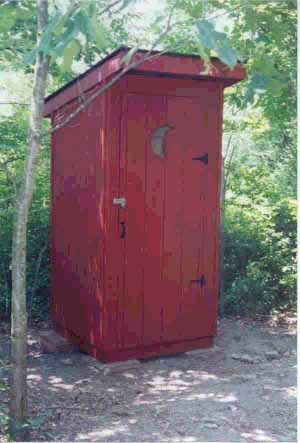 This is well-documented across the country and has been codified by not only the Commonwealth of Massachusetts but by the IRS. They note the benefits and keep a close-eye on communities where LHD’s are located. Just like an LHD, the ENTIRE city has benefited and now the entire Region and the State look to Newburyport as an economic leader. According to Dianne Eppa, Gary Calderwood wrote this new sign application. He has taken it upon himself to completely remove design review from the new signage rules. This means a single person, the Building Inspector, who has a history of disregarding and discounting historic preservation gets the final say. 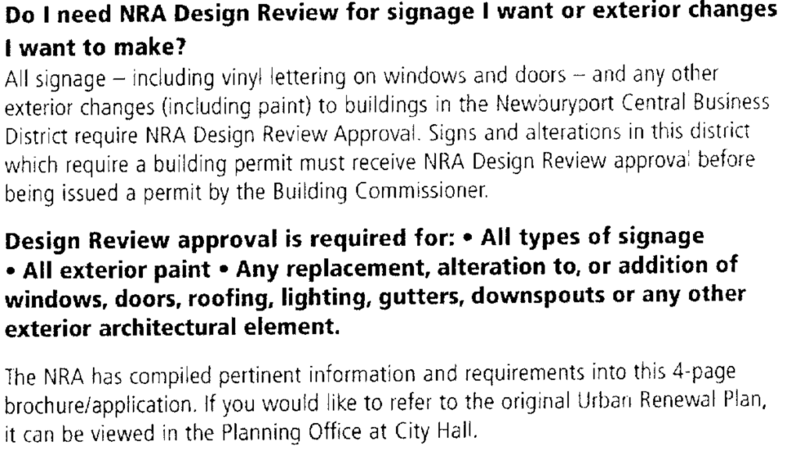 This gives owners including Newburyport Development, a free hand to do whatever they want as long as it follows the same rules that apply to any signage in town AS IF THE RULES APPLY DOWNTOWN THE SAME AS STOREY AVENUE OR THE TRAFFIC CIRCLE. The City Council has been bamboozled into thinking the NRA’s responsibilities over design review would continue under the City’s management. NOT SO! Here is the new application for signage. IT IS COMPLETELY DEVOID OF DESIGN REVIEW. It is crucial that the local historic district ordinance be instituted to cover the Downtown. IF WE DO NOT, WE TURN OUR BACKS ON OUR OWN SUCCESS OF FORTY-SOME YEARS. Newburyport Development is setting up Cathy’s Kitchen to fail. As Dyke Hendrickson in his editorial today indicated it is quite noticeable how ND likes to treat properties they would rather not have around. The miserable state of the stretch of Merrimac Street from Horton’s Yard to Route One. 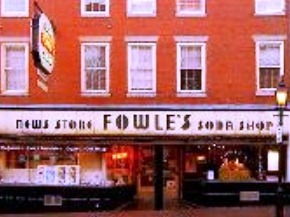 We all have noticed the deteriorated state of the Oldies Market, and now the Fowle’s News stand sign which is left to be in such a faded condition that it sticks out like a sore thumb. At one time, the art deco signage was sharp when the Downtown was restored but now it is faded and as Mr. Hendrickson has so noted, “Fowle’s was permitted to lose its luster.” Who owns the place? Newburyport Development. It is clear who is responsible for this deterioration. Our wealth is in the historic preservation of this Old Newburyport Seaport City. People are attracted by our history and the setting of the Federalist-style buildings. But ND has lost their way and now it’s Adam Smith’s ‘silent hand’ that rules. But now it appears that this large corporation wants to use a successful small business as its fall guy by having the community ‘angry’ at Cathy’s Country Kitchen. 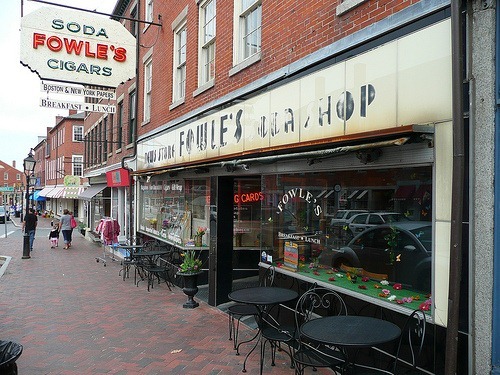 Moulton said she plans to preserve the historic neon Fowle’s sign over the door. The faded Art Deco façade will be redone to bear the new name, but she said she’ll preserve the marble counter inside and as much of the mid-20th-century décor as she can. She knows what it means to people. This exterior Art Deco Sign is one of the significant post cards that are currently produced to represent our City’s history. That’s why a preservation easement (Since left expired) was placed to preserve the exterior signage. Gary Calderwood’s brazen removal of all historic preservation design review from the new downtown signage ordinance has cleared the way for anyone to make any changes they want. Just as long as it satisfies the City’s sign ordinance as if our Downtown has the same status as Storey Avenue! I remember Ferlita’s, a fabulous Northern Italian eatery, that was in the present location of Agave’s many years ago. The food was so good that long lines could be seen at the entrance as people on Friday nights patiently waited for a table. Then the owner got into a big fight with Shirley’s Hot Dog stand and the local community became upset and an unofficial boycott was leveled. As the tourists disappeared at the end of the season, Ferlita’s was left abandoned and empty. It closed shortly thereafter. The Lagasse’s are going to stand by and setup Ms. Moulton to deface the front sign and then when people get angry, they’ll say, “Hey, she did it.” Isn’t this the same scenario when the CVS expanded? ND pushes out the White Hen Pantry and tells CVS to go on ahead, and guess who everyone is furious over? The big bad corporation. Well, fool us once but now we’re onto your modus operandi. I’ll be sending a letter to Ms. Moulton warning her of the setup. It will be up to her if she wants to be a fall guy or not. PS. With no LHD imposed downtown, we will be seeing more and more of disregard for our historic architecture and our historic setting. Is this really what our City wants? PPS. The Daily News was fully aware of what she is planning to do (They can read too) and cleverly avoided a picture of the Art Deco signage. Shame on them! I have been incredulous at the statements made by the anti-LHD movement. Speaking out of both sides of their mouth, they claim they appreciate and love historic preservation but they don’t want any protections put into place. Let me give you an analogy to demonstrate how ridiculous this is. Let’s suppose a large number of people really appreciate the fact we have a low crime rate. There are very few communities where you can walk down a street at 2:00 in the morning without being molested in some form or another. Yet, that is one of our hallmarks. Let’s also suppose that the citizens of Newburyport mark this redeeming character of our City by proposing canceling our local ordinances and laws. In fact, they take one step further and lay off the police force since they are hardly needed. Every criminal from the entire Northeast and beyond, violent and non-violent, would be making a hasty trip to lawless Newburyport. Like flies to an insect strip, they would crowd our city, exploiting without repercussions and it wouldn’t be long before we would be like the alternate future in Hill Valley in Back to the Future II. We already lost the protections of the Downtown in 2005. If we choose not to do a local historic district ordinance to recover those protections and to add High Street, and turn our backs on historical protections; the message is going to go out all across the Northeast that open season has commenced on Newburyport. Every desperate and two-bit developer is going to run to our town for an easy killing, demolishing, flipping, gutting, re-furbishing and installing upscale large homes until we hardly bare any resemblance to an Old Historic Seaport. Like zombies, new homeowners who have lost the value of their homes in other communities will be scrambling to get a piece of our City’s flesh. I’m no financial advisor but at least in my little domain; I’d be looking to sell and in a hurry. According to the National Architectural Trust, we’ve lost 700 historic homes since 1984, that means only some 2000 left. I encourage you to impress on our city councilors how important it is that we re-affirm our path to a bright future and restore and expand our historic protections. Unlike Mr. Strickland, I don’t own a shotgun. There are $449,000 available for projects this year. 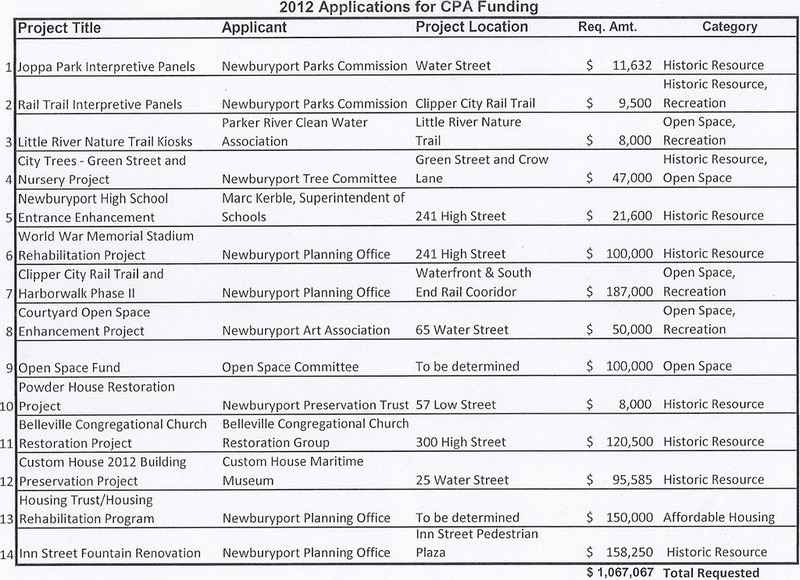 As you can see from the list below, the Community Preservation Committee has a challenge ahead. Now if logic were to prevail, it might be just achievable, but there is a lot of politics mixed into these projects complete with whole sectors of our community with vested interests in ‘their’ particular projects. Hopefully cool heads will prevail. In the coming weeks, several meetings will be organized around the three mandated CPA sectors: affordable housing (Just one this year), historic preservation and open space. It is hoped that PortMedia will be filming the deliberation proceedings as they did last year. Then everyone, either on the Cable or on the Internet; will be able to see and have a say as to where our tax money should be going!